The Flash now gets its very own “My Name…” is intro. Since the proposed Supergirl series is from the same people I am wondering if it does become a TV show, will we get “My name is Kara Kent…” I digress. The episode opens with Barry and Iris coming out of the movies. Talk turns to the Streak (better than calling him The Blur, which I am sure was deliberate) and Iris’ obsession of him. Barry tries to deflect but Iris is insistent on showing some evidence, however instead of showing a picture of the Streak on her phone, it is call from Eddie. While Iris is making plans to stay over at Eddie’s, Team Flash (Cisco and Caitlin) let Barry know about a police chase where Barry has the time to capture him into police custody and make it back before Iris finishes her phone call. At the end of the episode we see that Iris has a blog about all the Streak sightings. Vancouver filming side note: The Vogue, the theatre that Iris and Barry emerge is an actual theatre in Vancouver. A long time ago it was a movie theatre but now is a concert venue. It is on Granville Street and Smithe if you ever want to see some filming locations. We then meet our metahuman of the week, Kyle Nimbus aka The Mist (as Cisco later gleeful names him), takes out a crime family in a restaurant by turning into poisonous gas. When Barry and Joe go to investigate, Barry theorizes that a metahuman was behind based on where the bodies where found. Later at Barry’s lab, Joe pulls out all the evidence related to Nora Allen’s murder so they can work together to solve who killed her. Part of this involved Joe watching the police interview Henry Allen at the night of arrest and seeing Henry call for Joe to vouch for him. Since Joe and Barry know they are dealing with metahumans, they go to STAR labs to consult with Harrison, Cisco and Caitlin as to who could be behind it. The thought comes that perhaps they could use the particle accelerator to act as a prison for the metahumans that they do catch. Everyone but Caitlin is on board with that idea. When Harrison wants Caitlin to come down with him and Cisco to modify the accelerator to handle metahumans, Barry sees that she is reluctant and instead gets her help with identifying the metahuman. We learn why Caitlin is so reluctant as the particle accelerator is where her fiancee, Ronnie Raymond (Robbie Amell) died. In the flashback on the night the particle accelerator blew up, we see the two argue over their honeymoon destination but it is all goodnatured banter as we see that they are clearly in love with each other. Before the accelerator gets turned on, we Cisco warn Harrison about lightening in the area but this doesn’t concern Harrison. The particle accelerator comes on and it is deemed a success until the champagne starts to float up and Ronnie hears a bang. Since Ronnie is the structural engineer, he and Cisco go down to try and limit the damage and thus casualties. Ronnie tells Cisco to shut the door to the particle accelerator down if the doesn’t come back within two minutes. Unfortunately, Ronnie doesn’t come back and Cisco does shut the door down knowing that in lockdown mode, he won’t be able to open it. Fun Fact, according to a tweet from Mr. Amell, the Firestorm symbol is seen on that particle accelerator door. The fact that Cisco shut the door on Ronnie haunts him and he feels incredibly guilty. Later Caitlin goes down to the particle accelerator and talks to Ronnie, who tells her that he managed to get the blast to go up instead of out thus saving her and others. We see the blast over take Ronnie before the engaged couple gets a chance to say a proper goodbye. More on the flashback later. Back to the metahuman. In Barry’s lab, Caitlin and Barry notice that two sets of DNA was found: one the victim and the other unknown, no match was found. While they were waiting for the results, Barry manages to get Caitlin to open up about Ronnie and how he brought out the fun side in her. Caitlin says that Ronnie called them fire and ice. And after reading about Firestorm, we know that one of his villains is Killer Frost and Caitlin becomes that. But reading about Killer Frost, it seems the Caitlin version is not an evil villain but is dependent on Firestorm to keep her warm. So it will be interesting to see how The Flash plays on that. 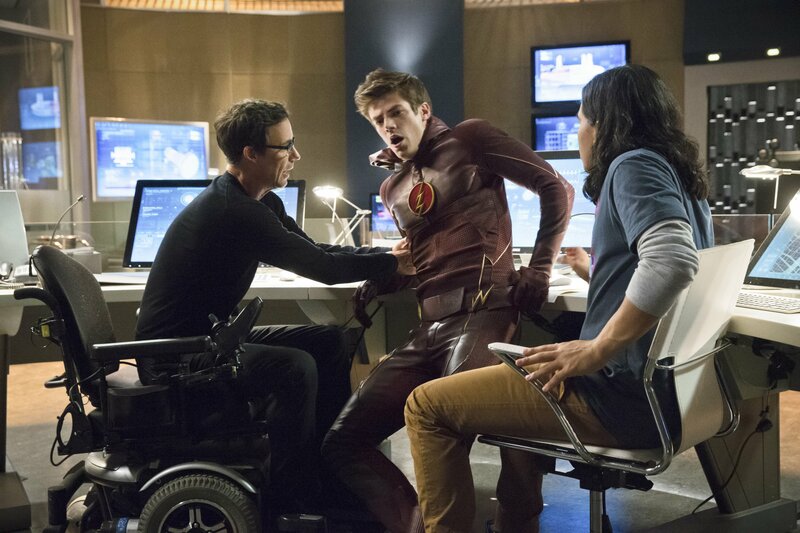 When Barry discovers that the metahuman wasn’t manipulating gas but is the gas, word gets out that a woman was attacked by gas at the Central City Mall. When the Flash goes to investigate, he confronts the Mist but can’t contain him as he keeps on turning to mist. Before Kyle leaves, he mentions that he has one more person on his list to take care of. The Flash does breathe in some of the gas and he manages to make it back to STAR Labs so they can take a live sample of the gas. Barry obviously lives and goes to Joe to tell him what he learned. Joe tells Barry that the victim was a judge and is going through her cases to see if they can find the Mist. Barry then tells Joe that he feels bad that he couldn’t save the judge and toys with the idea of breaking his dad out of prison. Joe is against the idea as Henry would then always be on the run. Joe preaches patience that they will catch the real killer. Team Flash ID Kyle Nimbus to Barry and we learn that Kyle was a hitman for the crime family that testified against him and the judge sentenced him to death. On the night of the particle accelerator explosion, Kyle was executed hence why he as the drugs in his system and what he emits when he turns to mist. The one more victim that Kyle wants to take care of: Joe, who was the lead detective on the case. Caitlin has managed to make an antidote for Barry to take in case he happens to breathe in the gas. Joe has gone to Iron Heights prison to talk to Henry to not only apologizing for not believing in him but also that he has re-opened the case and will find out who filled Nora. As they are talking, the Mist comes to claim Joe, which he does but the Flash arrives and gives Joe the antidote. Henry sees the Flash and father-son look at each other but before recognition sets in Barry moves his face real fast before he chases after the Mist. With no antidote, the Flash stops the Mist but getting him to keep on chasing him that forces him to tire and have to stay in his human form. Barry tells Team Flash that they got their man. There is a sub-plot about Iris and Eddie trying to keep the fact their dating from Joe. Eddie is tired of the lies and it looks like Iris might break up with him but the two fess up to Joe who reluctantly accepts the two are dating – mainly because he has no choice since he is recovering the Mist attack. In the STAR Labs prison, we the Kyle all angry but Cisco has devised a prison that will hold him. Question though: how will they get food to their prisoners? Cisco wants to fess up his part in getting Ronnie killed but Caitlin stops him from saying any more and calls Ronnie a hero for saving everyone and the share an ice cream. Barry goes to visit his dad in Iron Heights (earlier he tells Joe that he could have broke his dad out of prison but realized Joe was right). Henry tells a real cute story of how Barry was very late in learning how to walk but when he did, he actually more like ran and the first place he went was into his mother’s arms. In a end of episode voice over, Barry mentions that we all are running and that what he runs for is his mom or something like that. It seems that The Flash has gotten into the business of post credit scenes ala Marvel’s Agents of SHIELD. In this case, we flashback to after the particle accelerator has been contained. Harrison walks to that secret room and goes to that console to show security video of Barry being hit by lightening and Harrison hoping to see him soon. It also seems that all post credit scenes will help enlighten us to who Harrison is and is interest in Barry. Three episodes in and The Flash is my favourite show of the new season and it is all thanks to Grant Gustin, who I hated in Glee but find totally charming and adorable here.